who tries to do this. is hilarious and reading his posts were entertainment in and of itself. cookbook, I was so excited I signed up to test recipes! beef shorts…such promise in that combination! and then return the pot to medium heat. the coarsely ground black pepper to your pot. sure to turn the ribs occasionally to ensure even cooking. naughty girl and skipped this step – I like a bit of fat in my adobo). bit of sugar just to balance the flavors out. leaf…because I’m a horribly lazy person). much rice I piled on my plate, smothering it liberally in the aromatic and hearty sauce. Thank you and bravo Marvin! at National Bookstore branches. If you are elsewhere you can order it here. That looks mighty tasty! A wonderful book, I'm sure. Yum yum! I love your food pictures! Do you shoot them yourself? Hi Joey, I'm so glad that you and your family enjoyed this recipe. Hopefully you'll enjoy more from the book! I love beef short ribs and this recipe is a winner! Agree with you Marvin's recipes are fantastic and easy plus it's always great to support a fellow Filipino, especially someone as down to earth and humble as he is. Here's to Pinoy cuisine on the global table! Thanks for sharing this, Joey! I confess that I've never tried beef adobo as my family tends to be rather purist as far as adobo is concerned. But this looks so tempting! I want this cookbook! I have too many at the moment…but will put on my to buy list 🙂 Hopefully soon! Hi Betty Ann! Here here! 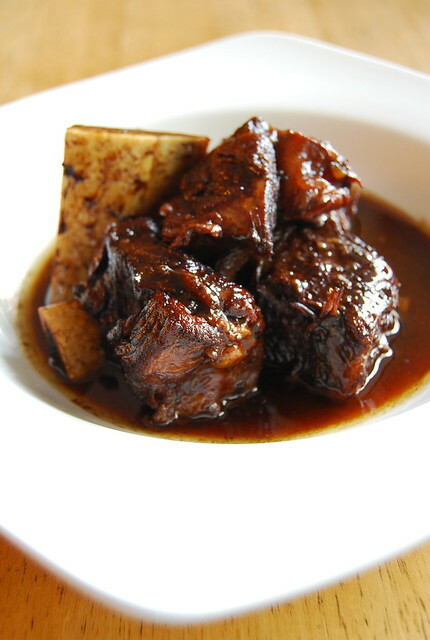 These beef short ribs adobo is a fantastic dish…we loved it! Love beef short ribs too so was immediately drawn to this. Bravo to Marvin! Hi Shnappy! Not as fancy as it sounds 🙂 It's easy! Love this dish!! Will make it. You hve a wonderful blog! !